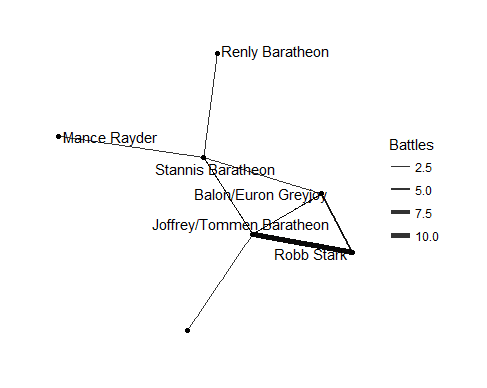 As promised, here's the network analysis and graph from the Battles dataset I introduced in this post. I based on my code on code available in this post. First up, we'll load the Battles dataset. Next, we'll prepare our data for the network model, which involves extracting the attacker and defender kings, and labeling them as such. Now we can create the object that will be used to create the figure. 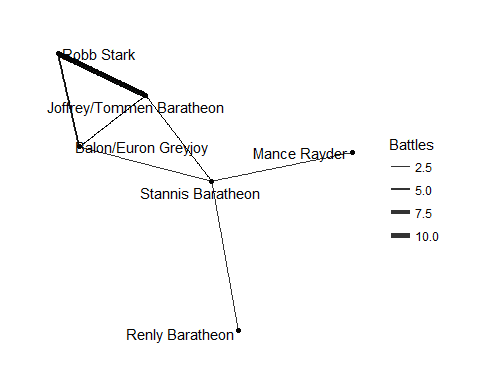 We want the figure to contain each of the kings, with lines between them indicating that they battled each other. The thickness of the line will be determined by the number of battles involving those kings. We have the data we need. Last step is to put it into a table used by the figure, which is created with ggraph. 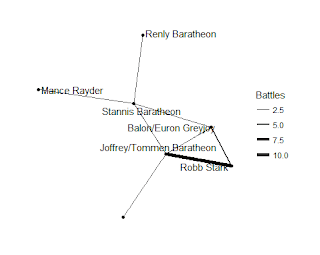 Most of the battles in the dataset were between Joffrey/Tommen and Robb Stark. 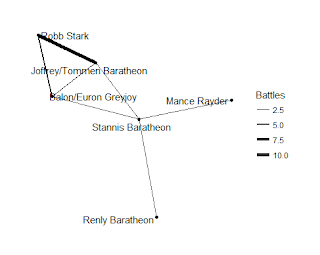 We have a blank spot in our figure; this refers to a handful of battles not involving kings, as well as one between Joffrey/Tommen and the Brave Companions. Here's the figure again, without the NAs.